The air could not have been more still that autumn morning, yet a tree near my back door was losing its leaves. One by one, they fell of their own weight as the tree let go. At that becalmed moment, leaves were dropping to the ground. 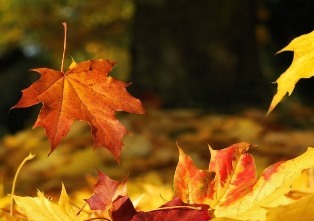 Usually we think the wind sweeps the autumn leaves from trees, and maybe it provides an extra tug. But trees decide to shed their leaves at the moment they deem best. Though they seem almost inert, buffeted by wind, soaked by rain, and baked by sunshine, they control their fates as much as any of us. We, too, can be uprooted by disasters, attacked by illness, cut down by predators, and suffer thirst. Being mobile does not make us less vulnerable. Or less willful. So on that chilly morning, I watched a tree prove that it was the master of its destiny. One by one, it clipped its bonds to its leaves, and they dropped off. The tree was taking action, and no one and nothing could stop it.